Cash For Cars Perth Service and get [FREE] Pickup Today! Cash for Cars Perth is a Service that we at Oriental Car Removal are proud to to offer to our fellow Westerns. Oriental Car Removal is your Used Car Buyer in Perth. We buy any make, model, year & condition of cars. If it has or had wheels, you have a buyer with just one call to us! You can get up to $9999 today. At Oriental Car Removal, it only requires a call to get an instant quote. We make quotes for cars of any make & condition, always offering our highest offer of $9999. Our appraisers are the specialists in cars like Toyota, Mitsubishi & Suzuki, but also specialise in all other brands. With us, Sedan, 4×4, Light Truck, Ute, SUV, Jeep, 4WD, Van, Truck or Motorcycle owners know they have a company they can trust for a fair and reasonable cash price for their cars. You can get the best price for your old car with us. We have very long experience in salvaging vehicles, and the process is always upgrading. We take every step, every part of it and perfected it. That allows us to buy any car, salvage it and sell the parts in a way that its beneficial for you and our company. This way you get extra cash for your car anywhere in Perth. Oriental Car Removal is auto wrecking yard that can cash any of your junk, unwanted, rusty and even without wheels vehicles. Just like with out cash for your junk car service, we can offer you money for your truck, van, suv and ANY other vehicle. 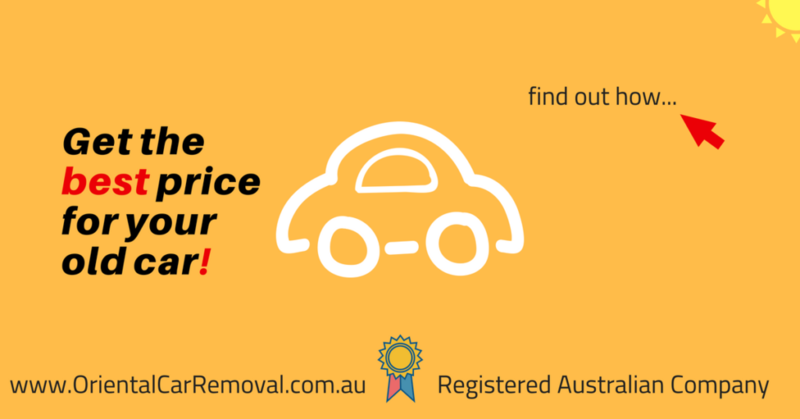 This Australian dollar Value for your auto’s can be up to $9999 and in some cases can even go above that limit. Just call us or submit a form to get your vehicle valued today. How does your Cash for Cars Service Works? It all starts with you communicating with Oriental Car Removal. All you have to do is Call to get your Car Valued about how much cash can you get for it. We send one of our teams to pick up the car. They have the Cash and the all the Paperwork ready for you. The Car Removal And The Paperwork are Free, so no extra costs for you. When we get there, you might be offered additional cash for your automobile if one of our inspectors says that we can salvage it for more. Deal gets done, you get rid of your vehicle. You get paid Cash, hassle free and easy. Which locations your cash services cover? Oriental Car Removal cover Perth, all of its suburbs and metro areas. When we buy your car, we take it to our wreck yard to perform eco-friendly recycling. We are fully trained in wrecking & recycling all brands- top foreign to local- be it Toyota, Mazda, Audi, Ford, Holden, Nissan, Mitsubishi, Volkswagen, KIA, Subaru, Isuzu and many more. At Oriental Car Removal, we’ll come to your location to pick up your Unwanted Car. Our appraisals are made over the phone or through our web page, and for car owners that accept our offers, we schedule a quick inspection of their car and a removal all in one. Our Same Day Car Removals are always at convenient times for our customers, and always performed quickly. Within 24 hours, you’ll get rid of your car and count top dollars up to $9999! With us, there are no hassles when selling a car. We are your buyer that makes a quick cash quote, so you know before any time is wasted whether you want to sell your car to us. If you choose to sell your sedan, 4WD, truck, SUV, economy, luxury, sports, Ute, Jeep or motorcycle to Oriental Car Removal, all that is necessary is to schedule a Free Car Removal anywhere in Perth, and be there when we arrive. We only require the title of ownership for the vehicle or its scrap certificate. All other necessary paperwork is brought by us, and will ensure all the legalities are complete so that when we drive away with your car so does all your responsibility and liability for the auto! Schedule a Free Car Removal (our pickups are provided as a free, around the clock service to all of our Perth customers). Get top dollars for your Car up to $9999.